In 1980 gold topped out at $850.00. That bull market produced an increase of +2,276% from start to finish. 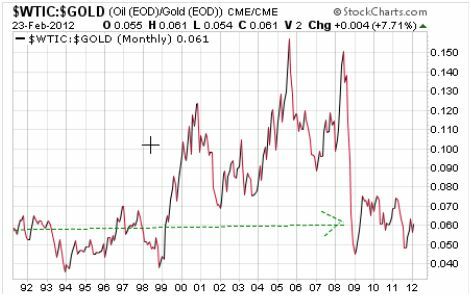 The current rally in gold began in 2002 at $260.00 and has thus far risen +582%. By comparison this current bull market has the potential to rise much further. In 1980 silver topped out at $50.00 after rising +3,100%. 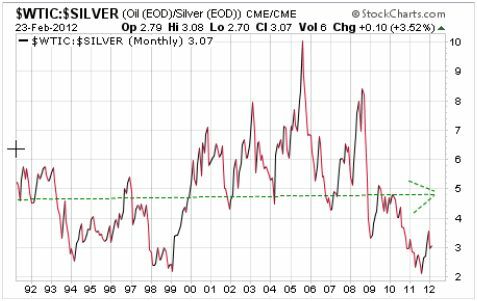 The current bull market in silver began at +/- 5.00 in 2003. It has thus far risen +600%. 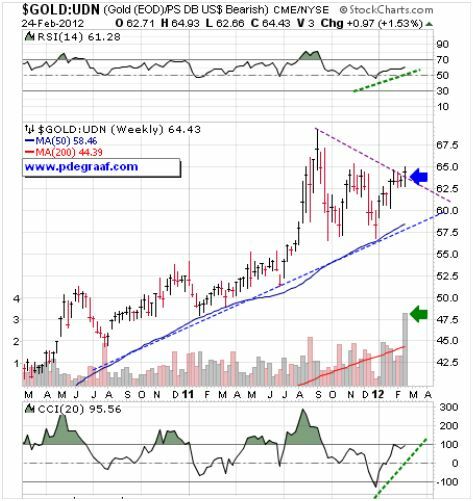 Silver also has the potential to rise much further. 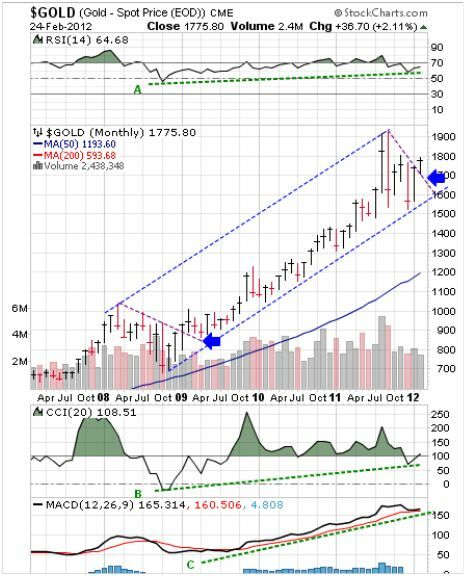 Featured is the monthly gold chart. The uptrend is well defined within the blue channel. The supporting indicators A, B and C, are rising as well. Price is breaking out from beneath the resistance line. The last time this happened gold rose for almost three years. During that time the price doubled! A double from here takes gold to $3,500.00! “The fear of hard times leads to inflating the money supply and inflating the money supply leads back to hard times.�? …Ayn Rand. This chart courtesy US Treasury and UBS shows the dramatic shift from US Treasury bills and bonds to gold bullion, on the part of China. This is a very bullish fundamental factor that is underpinning gold. “A trend in motion remains in motion until an outside event comes along to stop it.�? China needs gold as part of its plan to make the Yuan as dominant as the US dollar has been since 1944. “Nations are not ruined by one act of violence, but gradually and almost imperceptibly by the depreciation of their currency, through excessive quantity�? … Nicolaus Copernicus 1525. Featured is the index that measures gold against the 6 currencies that make up the US dollar index. This trend represents gold in foreign currencies. Notice price is breaking out at the blue arrow from a large pennant formation. Volume is confirming the breakout. This confirms that the bull market in gold is not limited to a lack of confidence in the US dollar. This is a worldwide bull market where the participants are showing a preference for gold over all fiat currencies. “The fear which fires inflation is the desire to contract debts, and at the same time, avoid at least partial repayment of those debts: R. J. Rushdoony (from ‘Roots of Inflation’). Featured is a 20 year glance at the index that compares crude oil to gold. Expressed in gold the price of oil (except for fluctuations above and below the average), is virtually unchanged. If you sold a small gold coin once a week or once a month, and used the proceeds to buy gasoline for your car, you would have been paying the same price, on average, for the past twenty years, and most likely longer than that. “When governments and their central banks conspire to expropriate wealth from investors via their inflationary stealth taxes, the only way to come out ahead in this game, is to always be invested in whichever market happens to be in a secular bullish trend.�? …..Adam Hamilton. Featured is a twenty year review of the index that compares crude oil to silver. The same principle that applies to oil/gold also applies to oil/silver. Does this reinforce the need to own some gold and silver coins? Hyperinflation (inflation at +20%), during my lifetime: Argentina, Austria, Bolivia, Brazil, China, Croatia, Ecuador, France, Germany, Hungary, Indonesia, Iraq, Italy, Mexico, Mozambique, Peru, Poland, Romania, Russia, Turkey, Uruguay, Venezuela, Vietnam, Yugoslavia, Zaire, Zimbabwe. Do still think it won’t happen here? 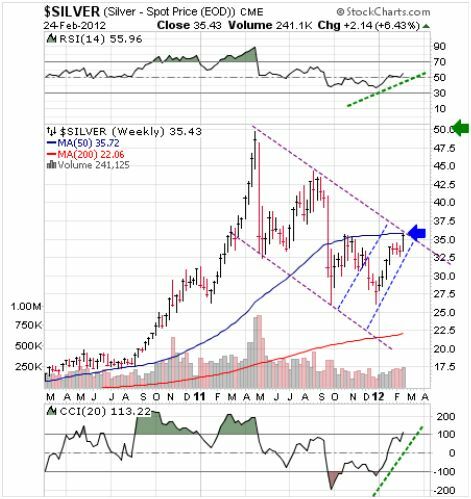 Featured is the weekly silver chart. Price is carving out a large flag. The supporting indicators are positive (green lines). A breakout at the blue arrow sets up a target at the green arrow. “Silver in RFID chips (Radio Frequency Identification). Next generation RFID chips will feature a tiny antenna which will increase the range for scanning the chip from 5 meters to 15 meters. This silver will be in too small an amount to make it economically recoverable. The number of RFID chips will eventually be in the billions.�? …David Morgan. The last time I wrote an article was in January. Gold was trading at $1,622.00. My outlook was bullish at that time, and it is even more bullish today because of all the money printing that is going on. For your convenience we have updated the home page of www.pdegraaf.com. We now feature live data for 14 commodities and indexes. Be sure and bookmark the site for future reference. To refresh the page, click the F5 key on your keyboard.